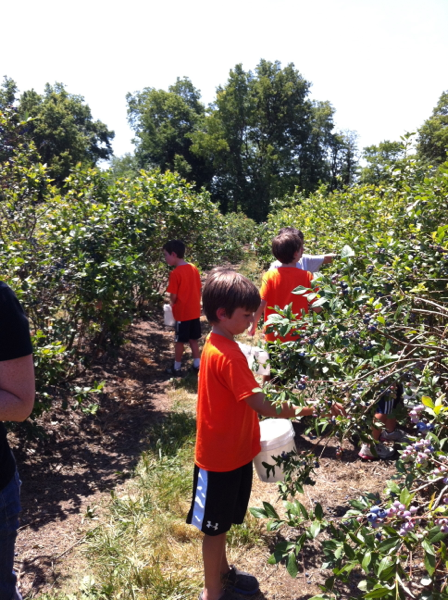 One of our summertime traditions is to visit a local blueberry farm and do some blueberry picking with friends. The kids always have a blast hanging out together. They also enjoy picking (and eating) blueberries. Meanwhile, the moms appreciate the bounty of blueberries that will stock our freezers for the next year. I saw this recipe for oatmeal earlier in the spring and knew I wanted to give it a try. Boy was I glad that I did. 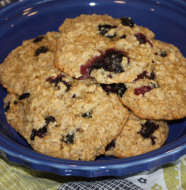 It is a little different from the other baked oatmeal recipe I have tried and definitely different from your traditional oatmeal but it was delicious. I loved the combination of blueberries and bananas though in full disclosure I will be honest and say my boys did not enjoy this very much at all. 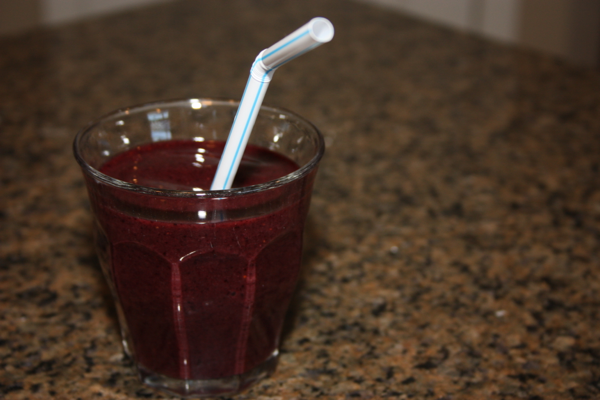 Even though they were not fans, I will be making it again because I loved it and it gives me one other healthy item to add to my breakfast rotation. On the plus side, since William and Tyler didn’t really enjoy it I had leftovers that were still delicious when reheated. Preheat oven to 375 degrees. Grease or spray a 1 and 1/2-quart casserole dish with either butter or cooking spray. In a medium bowl, combine the oats, half of the nuts, the baking powder, cinnamon, and salt, stir until well combined. In a separate small bowl, whisk together the maple syrup, milk, egg, half of the melted butter, and the vanilla. 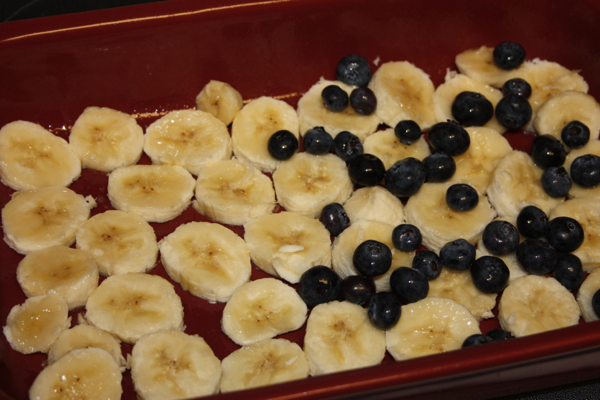 Bananas and Blueberries layered in the bottom of the baking dish. Place the sliced banana pieces in a single layer in the bottom of the prepared casserole dish. Sprinkle about two-thirds of the fresh blueberries over the top of the bananas, then cover the blueberries with the oat mixture. Drizzle the milk mixture over the oats, making sure to distribute the milk as evenly as possible. 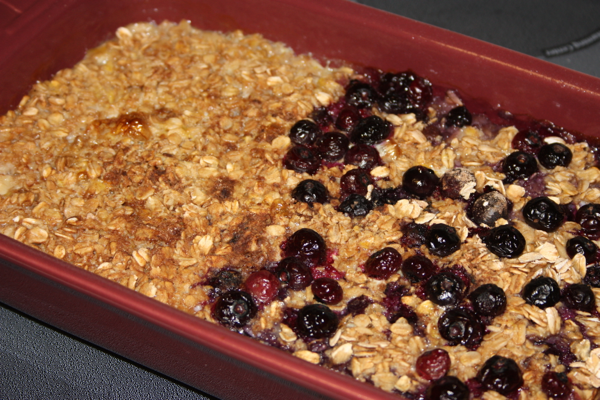 Sprinkle the remaining blueberries and walnuts over the top of the oats. Bake the oatmeal for 35-45 minutes, until the top is golden brown and the oats have set. Remove the oatmeal from the oven and drizzle the remaining butter and sprinkle of brown sugar over the top before serving. I only added blueberries on half of the oatmeal since William isn’t a huge fan of blueberries in baked goods. 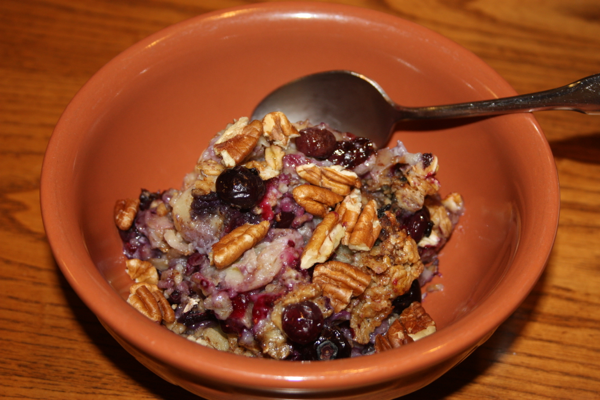 2 Comments on "Baked Blueberry and Banana Oatmeal"
I will definately try this for the coming week. My husband and I visit a blueberry farm about an hour from here with some friends every year. 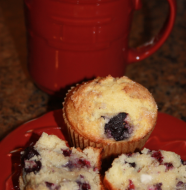 We just got back this weekend – I picked 3 gallons of blueberries….this will be an awesome treat. There are a few times when I too love when my kids don’t like something I made, and that is when it is really good and you want it all to yourself !! I think it looks DE-LISH ! !